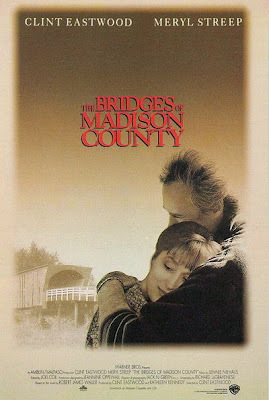 Love is that magical string that keeps this world intact,by keeping Everyone's world intact.The Bridges of Madison County is a very mature love story between mature people,based on the 1992 best-selling novel by Robert James Waller with the same title.The film has Clint Eastwood and Meryl Steep,two of the most accomplished actors of the last century,in lead roles. Francesca Johnson(Meryl Streep),a married lady with children meets Robert Kincaid(Clint Eastwood),a photographer who is on his assignment to the Iowa state for a photo feature.They develop instant affinity towards each other,discuss a variety of things and fall for each other.They spend four days together as Francesca's husband and children are out for a state fair and then part each other.Francesca preserves her love for Robert ,documents her love in her diary and leaves it for her children.The movie actually unfolds as her children read her notebooks. The film can be aptfully summarised with the following poem by Lord Byron.The poem will be featuring in the film also.Since I liked it so much,I am reproducing it here. The film features some of the intense and beautiful romantic lines you would have ever come across in films. "I don't think obsessions have reasons.That's why they're obsessions." "But this kind of certainty comes just once in a lifetime." "Do what you have to be happy in this life,There is so much beauty...Go well, my children." Clint Eastwood as a director is getting better like a old wine.Ofcourse, there are better examples like "Letters from Iwo Jima" and we all know his Oscar winning "Million Dollar baby"...But this one's no-less. The cinematography is awesomely great capturing some of the beautiful images of the Iowa state...Poetry on celluloid.I need not substantiate the performances of the lead actors and it would be re-stating the obvious.This is a very mild and dialogue-centric story and doesn't require a lot of acting assignments.However, Meryl received a Academy nomination for the film for "Best Actress in a lead role". The film is generally slow and you don't have a lot happening on screen except a middle-aged lady and an old-man talk,understand each other and fall in love. 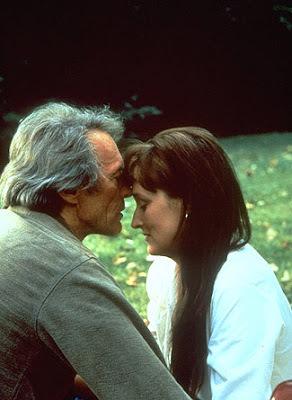 Watch it as Clint Eastwood and Meryl Streep share the screen-space and for its insightful and beautiful dialogues.